The market for educational apps for juniors ages 2+ is a crowded place, with plenty of great apps already covering most essential topics like letters, numbers, shapes, and colors. But one thing I noticed we don’t have is more apps to introduce textures, sizes, roman numerals, and shades of colors. Fortunately I found a brand new app called TapTapToink. The app introduces these topics in a fun and intuitive way, and is suitable for younger juniors. The app is divided into several screens, each introducing a different topic. To navigate to the next topic/screen, use the arrows on the top right corner. You can navigate to the previous/next topic even without finishing the current activity. In the first screen, juniors learn about colors by tapping to match three colorful circles. Each time a match is found, a smaller circle of that color appears at the bottom of the screen. Once all colors have been matched, you will be rewarded with an animation. Two activity types included in this app are matching and jigsaw puzzles. In addition to colors, you will be matching textures and shapes, and combining parts of vehicles or farm animals. Each matching game has its own contextual reward; for example, in the farm animals and vehicles game, you will get colorful sound icons representing each animal’s or vehicle’s sound. The app also offers seven different jigsaw puzzles with animal themes, such as elephant, giraffe, owl, and cat. The puzzles are relatively easy for juniors ages 2+ to complete on their own. TapTapToink is filled with fun and noisy sound effects. They offer an immediate feedback as juniors interact with the app. The app also offers fun and fluid animation to keep them engaged. None of the activities is meant for juniors to memorize. There is no text nor labels that indicate what each object is. The app doesn’t include narration. The matching games are only meant for juniors to recognize and match the different patterns. But you can use the app to introduce a great deal of topics that are not covered well in other apps, such as sizes and shades of colors. The closest thing that TapTapToink has for introducing numbers to younger juniors is an activity called "Time", in which juniors are asked to match three roman numerals commonly found in analog clocks. This helps juniors ages 4+ to learn about alternate ways to represent numbers. I really like the way various animations are implemented in this app. They are fluid and unique, showing relevant transformation for each context. 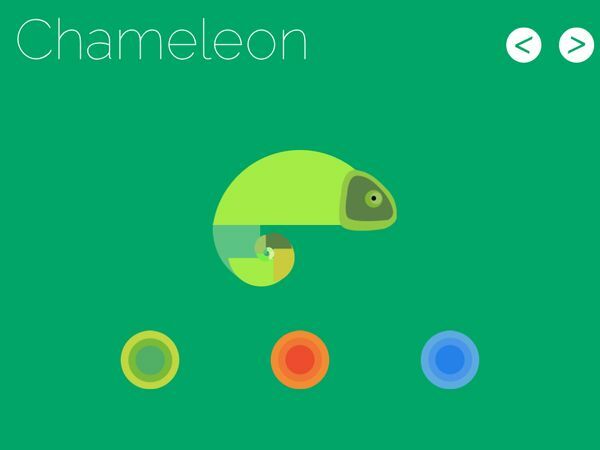 For example, in the jigsaw puzzle featuring a chameleon, juniors can tap on the colorful icons to change the background, which in turn will change the chameleon’s color. TapTapToink is a nice addition to the list of great apps designed for juniors ages 2+. The app, filled with animations and sound effects, offers a fun and intuivite way for juniors to learn about sizes, shades of colors, and roman numerals.